We have gained a remarkable position in the market that is involved in offering Stone Kumkum Dabbi Kankavati. We introduce our business as a notable entity of a qualitative array of Silver Kankavati. Plate madeup of plastic best for return gift for any occasion. Get beautiful kankavati with Indian traditional touch. This wooden made kankavati will make your dish of worship unique than others. 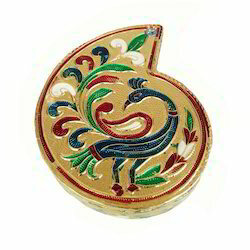 Also you can use this nice kankavati at your home’s temple. Exclusively hand crafted Kankavati with fine ceramic and stonework on it done by our specialized craftsman. Bright colours gives special INDIAN LOOK. - Ideal for gifting purpose. Also preferred as wedding favors in INDIAN WEDDINGS. - Approx. weight 100 gms. - Price Rs. 225= per pc. 5 inches paisley decorated with golden metal ball chain and kundan. 2 golden vatis also given to hold kumkum and rice.